Idyllic settings, unconventional techniques and materials, large scale, and unusual color schemes: this is how one can describe Hans Schiebold’s spectacular landscapes. One is intriqued by the thickly applied paint that reads like a geological time clock, exposing layers of the earth’s formations. From close-up, the paintings are a complexity of a abstractly applied patches of paint which merge into a harmonious whole from a distance. 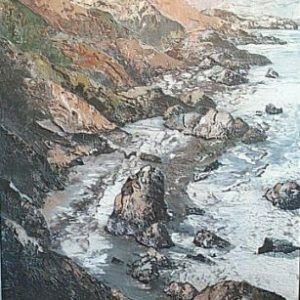 Hans’ approach to painting (in his own words) is very process orientated by which detail is created by unconventional tools (spatulas, etc., and no brushes) with a mixed media (acrylic based) of his own making. The results are as intriguing as they are original. There is no contemporary equal to whom those works carry a resemblance. Hans, trained in the former East Germany, as a decorative wall and ceiling artist, left his country on the eve of the building of the Berlin Wall and immigrated to the United States at the age of twenty seven. 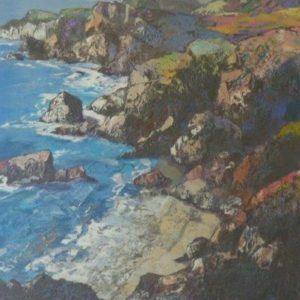 He obtained his MFA from the U. of Hartford, CT. and taught painting for twelve years at Wesleyan U., CT. and Wichita State, KS. By choice, Hans moved to Portland, OR. to pursue his desire to paint full time. 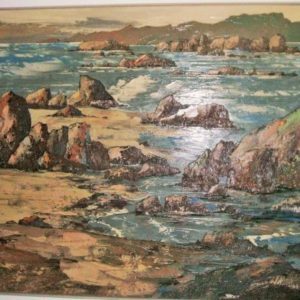 These years in Oregon have been extremely rewarding and productive in his artistic pursuits. His work has changed progressively from an abstract style to a more representational emphasis.